Every month I write a blog for the Design Style Guide , the Etsy team that I am a member of. I wanted to share it on Joy de Vivre with you all to show you the beautiful things my team members have created! 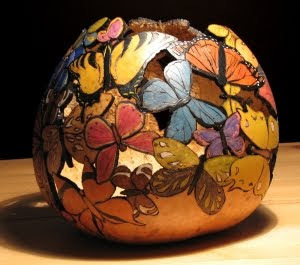 The Rustic Butterfly Bowl is actually crafted by Inspired by Nature from a gourd! How is that for reusing nature in a beautiful way! 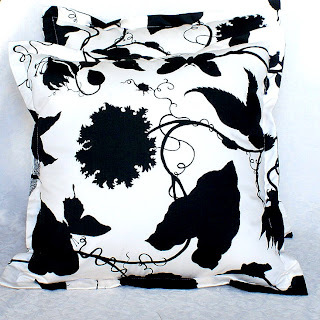 The Flanged Decorative Pillow in Black and White Floral and Butterflies by Pillow Throw Decor brings in a lovely motif in colors that are easily worked in to any decor. 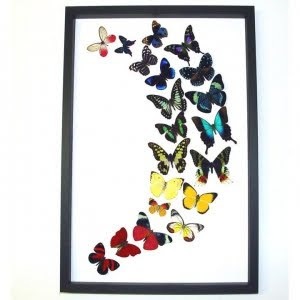 Over the Rainbow a Real Butterfly Swarm by Butterfly Designs use real butterflies in their colorful artwork. 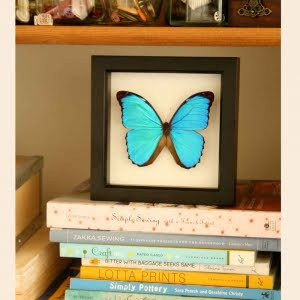 Blue Morpho Real Framed Butterfly from Bugs Under Glass use butterflies that come from the rainforests of Central and South America. 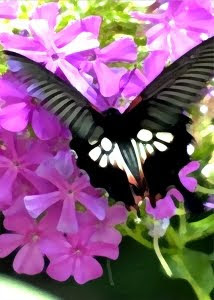 Butterfly in the Midst of Flowers from Everything Dear comes in a vivid 8"x10" photo. Adding any of these finds to your room decor is sure to give it a beautiful transformation, second only to that of the butterfly! Beautiful items. I particularly like the cushion cover. What amazing and beautiful designs! I just love the gourd bowl! Thanks for sharing these.